Physical fitness is something that many lack. Some of the reasoning behind this is that people are busy and find it hard to make fitness a priority with all of the other daily tasks that are seemingly more important. Taking care of your physical health does not have to be time consuming and it can be exhilarating, fun, and empowering. This article will share some of the ways that boxing classes can help you get fit while having fun! One of the greatest benefits to any workout is the ability to reduce stress while allowing your body to secrete natural endorphins to your brain, enhance your mood, and improve sleep. Boxing is great for reducing stress because it allows you to experience a high intensity workout all the while keeping your focus on your boxing and not at troubles that are on your mind from work or home. Allowing yourself to have a mental break while working out can put problems in to perspective. After your workout you will likely be able to look at challenges you are facing with a more level head and then work them out. Getting up and moving can help your heart a great deal. Helping your heart and lungs adapt to stress from exercise is a great way to reduce potential problems later on in life such as, but not limited to, heart disease. While boxing, you will be punching, kicking, and jumping which will increase your heart rate, making you healthier with every jab. Professional heavyweight bags that you will likely find in a boxing studio weigh upwards of 100 pounds. Punching, kicking, and moving a 100 pound bag around with force is going to help you increase strength. It may take time but after a while you will be punching your way to more defined arms and increased upper body strength. Research shows that those with good hand and eye coordination have better reflexes and response times to things coming at them. When boxing, you need to be able to respond immediately and react. It may be hard at first to react and respond to situations that challenge you, but after sticking with your classes for a while, you will notice a vast difference. One way that you will notice improvement is in your ability to hit or defend yourself from a moving target. Sometimes, you may be paired up with a sparring partner and your ability to react to their movement will improve over time as well. You will even be able to begin to predict their movements and respond accordingly. Working out does not have to be boring and feel like a chore. Boxing is a great way to challenge your mind, body, and soul while getting fit. 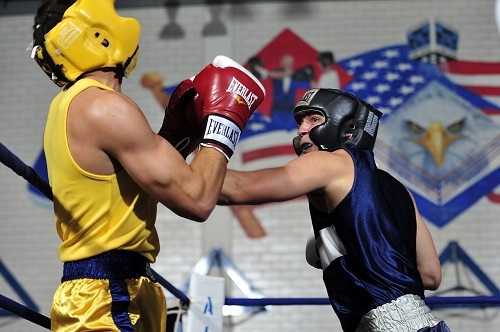 If you are looking for a fun and challenging way to get fit that will not bore you after a few sessions, try out boxing classes in Baltimore Maryland. This entry was posted in Other Sports and tagged Boxing, Boxing Classes, Fitness. Bookmark the permalink.